Liverpool have worked excellently to secure the long-term futures of their key players, and Gini Wijnaldum‘s name stands out as the next contract priority. Mohamed Salah, Roberto Firmino, Sadio Mane, Andy Robertson, Trent Alexander-Arnold, Joe Gomez, Jordan Henderson, Harry Wilson, Rhian Brewster, Marko Grujic, Curtis Jones and Caoimhin Kelleher have all put pen to paper in the past year. Meanwhile Alisson, Virgil van Dijk, Fabinho, Naby Keita and Xherdan Shaqiri joined in 2018, ensuring the majority of Jurgen Klopp‘s core are tied down. As crucial as the Reds’ work in the transfer market has been, equal are the strides made in ensuring those already at the club are committed to the cause at Anfield. There are now few first-team regulars whose terms expire in the next two years, with those with deals running down—Simon Mignolet (2020), Alberto Moreno (2019), Joel Matip (2020), James Milner (2020), Adam Lallana (2020), Daniel Sturridge (2019) and Divock Origi (2020)—coming to a natural end to their spells on Merseyside. 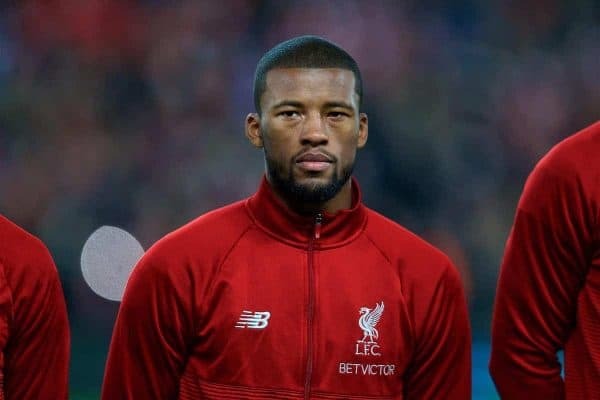 But after Alexander-Arnold and Robertson signed new five-year deals in recent weeks, the focus should now turn to Wijnaldum. The Dutchman’s deal currently expires in 2021, and though he therefore is still locked in for two-and-a-half years, his importance to Klopp’s side, and excellent form, warrant an extension. Ahead of a season without European football, Wijnaldum’s arrival was part of a comparatively low-key summer transfer window for the Reds under Klopp. The last through the door following Matip, Mane, Loris Karius, Ragnar Klavan and Alex Manninger, the Dutchman was one of the marquee names of an off-season that required the club to play it smart. Despite fostering a reputation as a goalscoring midfielder in his season at Newcastle, and with similar expectations from supporters, he slotted into a more conservative role and shone. But a bizarre statistic that saw him go 1,082 days without a goal away from home prompted scrutiny over his performances on the road, and perceptions of Wijnaldum were tainted. This season, however, and particularly when operating even deeper in the No. 6 role, he has proved his consistency, and is integral to Klopp’s system. His close control, willingness to take the ball in tight situations, covert movement, off-ball endeavour and growing tactical discipline have made him one of the first names on the team-sheet. 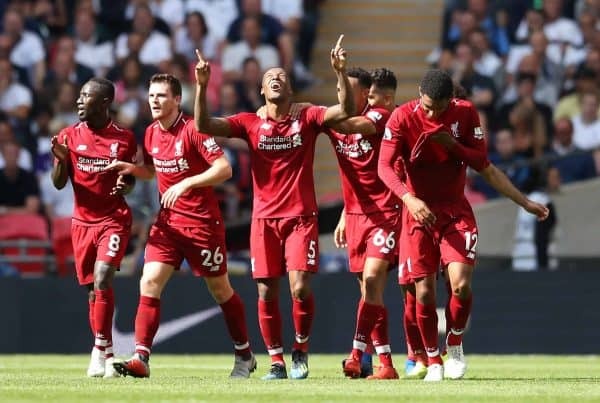 While the likes of Fabinho, Henderson, Keita and Milner have been rotated in the middle of the park, Wijnaldum has been a near-constant in Liverpool’s best start to a league campaign ever. His qualities on the pitch are central to that, but so too are other variables that Klopp no doubt cherishes. Wijnaldum boasts impeccable fitness, having been described, by Dirk Kuyt no less, as “a player with the lungs of a horse” on his £25 million switch to Anfield. While he missed the most recent 4-3 victory over Crystal Palace due to a knee injury, Wijnaldum has rarely been sidelined in his two-and-a-half seasons with the Reds so far. He played 42 games in his first campaign, sitting out for just five, then 50 last season, missing six, and ahead of the visit of Leicester on January 30, he has featured in 27 of a possible 31 games this term. Therefore he has played in 108 of the Reds’ 123 competitive fixtures since he joined, or 87.8 percent, and of the 15 missed, five were in the FA Cup or League Cup, when Klopp has often shuffled his pack. In 2016/17, he played the fourth-most minutes of any outfielder (3,338); in 2017/18, this rose to the third-most (3,600); and in 2018/19, he has tallied the sixth-most (2,199). Remarkably, he almost clocked as many minutes on the pitch for the Reds over the past two-and-a-half seasons (9,137) as Lallana has since he arrived from Southampton back in 2014 (9,660). There paints a dichotomy between the reliable and the frustratingly injury prone, though Wijnaldum’s omnipresence is not solely due to his fitness, but also his versatility. 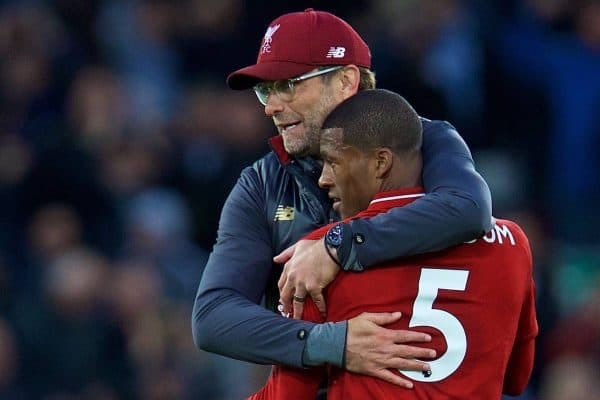 Wijnaldum described this as “a quality, but also a weakness,” adding that “if players can only be in one position, managers do not even think about moving them,” but in the Reds’ fluid system, flexibility is currency. He has certainly bought into this philosophy, and this selflessness, allied with his amiable personality, have made him a very popular member of the squad. 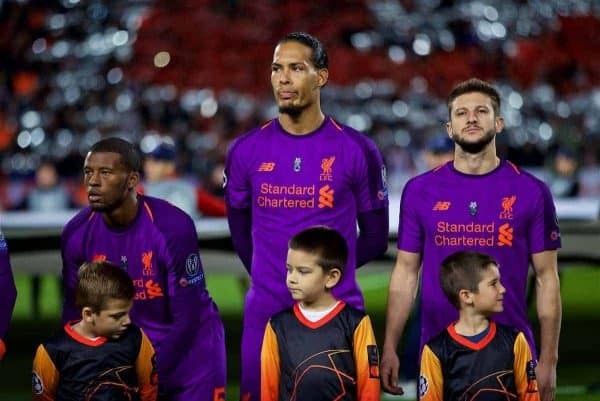 In October, Klopp revealed that, in the event of neither Henderson or Milner starting, the squad voted for Van Dijk as third captain, and Wijnaldum as fourth. 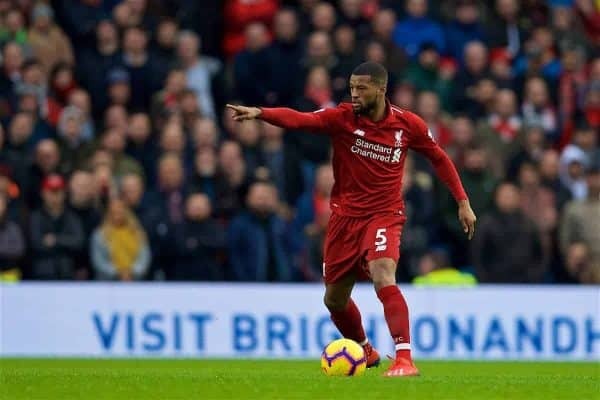 There is a natural leadership to Wijnaldum’s game that bears comparison with Milner, and it is not in the realms of fantasy to suggest that the 28-year-old could emulate his vice-captain in playing well into his 30s. Of course, Wijnaldum’s creeping age for a top-level footballer could be used as evidence against offering him a new four- or five-year deal, but there is also a convincing argument for. 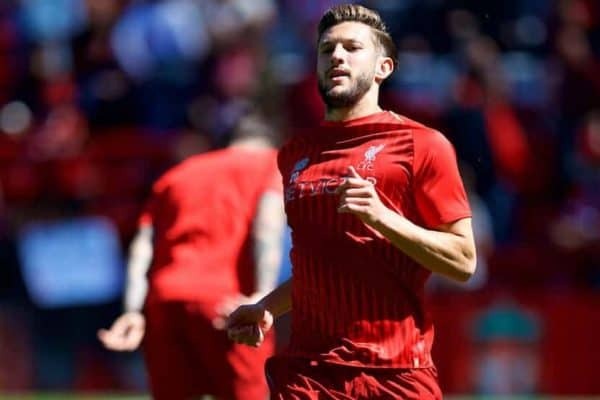 Liverpool’s decision to extend Lallana’s contract two years ago has proved to be a controversial one, with the roving midfielder plagued with fitness issues throughout his senior career. It was this that prompted Mauricio Pochettino to take a cautious approach while manager at Southampton, substituting Lallana in 30 of the 56 appearances he made while he was manager at St Mary’s. And this same problem is now limiting his game time in what should be the prime of his career: since signing that new three-year deal in on February 22, 2017, Lallana has played 32 times for the Reds, totalling 1,372 minutes and averaging 42.9 per appearance. Over the same period, Wijnaldum has played 90 times (almost three times as many), totalling 6,966 minutes (five times as many) and averaging 77.4 on the pitch per outing. There is no suggestion at this stage that Wijnaldum will suffer the same fate as the No. 20, and having already shown his ability in a deeper, less physically demanding role, handing him a new long-term contract seems a safe bet. An existing example of this comes with Henderson’s new five-year contract in September—a deal that retains him until 2023, when he will be 33; Wijnaldum is 148 days younger. Both parties have time on their hands, and this may be why the club have kept his deal a lower priority, but it can also be argued that Wijnaldum warrants a pay-rise. According to the Chronicle ahead of his exit from Newcastle, the midfielder made a £75,000-a-week agreement with Liverpool in 2016, and compared to other recent contracts, this is relatively paltry. Van Dijk is reported to earn £120,000 a week, Mane is on £150,000 a week, Firmino’s wage has risen to £180,000 a week and Salah is the club’s highest earner on £200,000 a week. Along with summer signing Alisson and another player to recent sign a new deal, Robertson—whose wages are not readily available—this is the six-strong group to play the most minutes for Klopp so far this season. Just behind Firmino (2,224) is Wijnaldum (2,199) and using this as a barometer of importance this would suggest that Liverpool’s No. 5 is in line for a reward for his role in the squad. A player’s earnings should certainly not be a factor for supporters to consider in this regard, but the lingering prospect of a better offer from elsewhere can be. 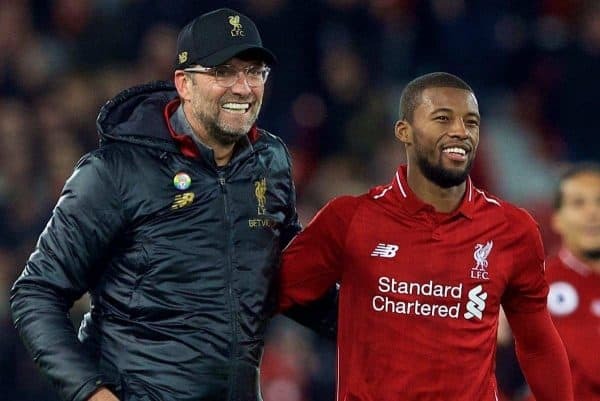 And while there is no indication Wijnaldum would look to leave Merseyside any time soon, his warming rise to prominence under Klopp should ensure an improved deal is in the offing.